Perfect games don't come easy. In the US, 23 pitchers (21 under modern rules) have the honor of having pitched a perfect game. Interestingly enough, ten of those have happened since the last perfect game in the NPB. 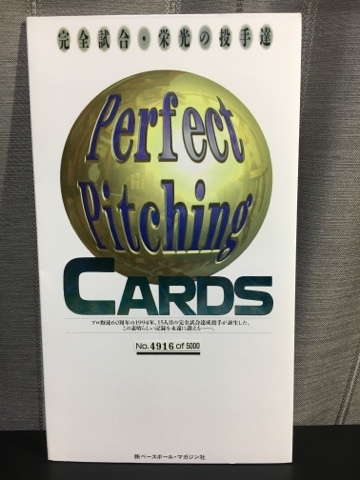 Much like the No-Hitters set BBM issued in 2012, the Perfect Pitching set came on the heels of what remains the last recognized NPB perfect game. 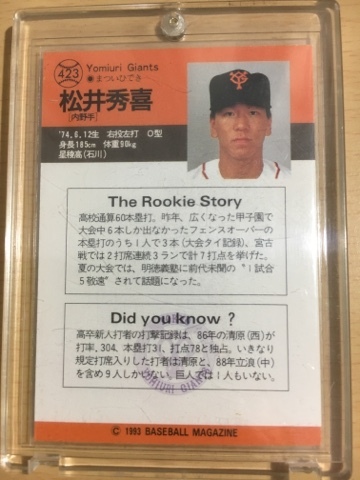 Hiromi Makihara of the Yomiuri Giants beat the Hiroshima Carp 6-0, striking out seven batters on May 18, 1994. 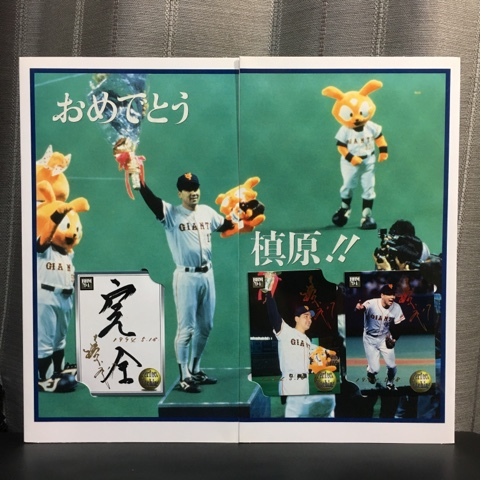 Opening the album, or really, giant card holder, reveals three cards honoring the game, including a celebratory photo and three cards. 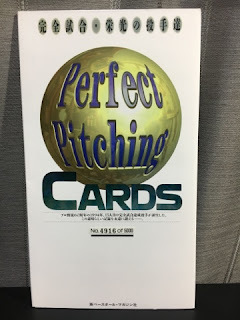 Inside are cards for all fifteen perfect games thrown in the NPB. 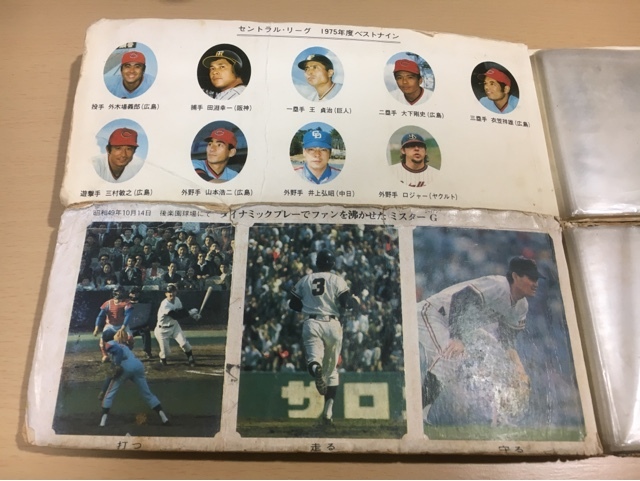 On the far right, a placeholder (really just a sheet of paper) is included for Tsutomu Tanaka, for whom BBM could not get the rights. 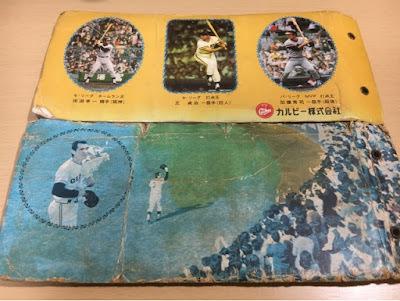 The back includes the photos found on the card fronts. You can see the original retail price was 2000 yen. 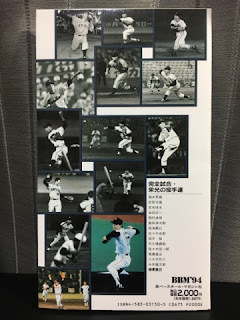 Before you say anything, yes, there was a perfect game pitched in the NPB after 1994. In 2007, Daisuke Yamai and Hitoki Iwase combined to throw a perfect game in Game 5 of that year's Japan Series against the Nippon Ham Fighters. However, NPB does not recognize combined no-hitters, so as far as the record books are concerned, Makihara was the last pitcher to throw a perfect game. I told you I got them cheap, and here's why. They are, shall we say, well-loved. I don't know what was sitting on top of that album on the top, but there is very little fading only in that center-top part. Both are fraying pretty badly but are intact. Here are the backs. The top album is one of two card holders issued in 1975. There was also a pocket book of some sort released that year. 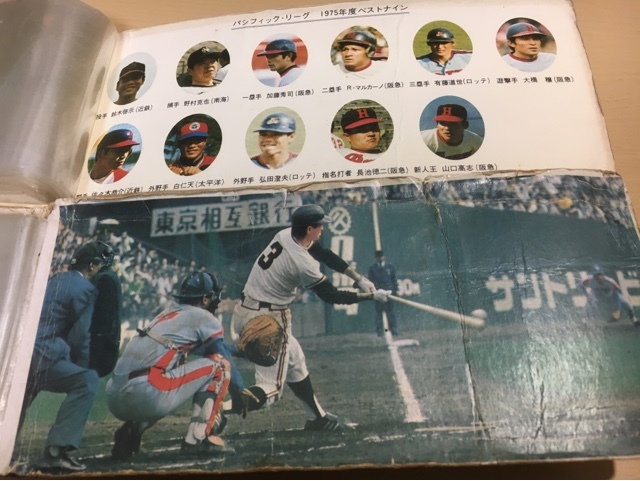 The bottom album has Nagashima on the front and back, and dates from 1974. Three card holders and a pocket book were available as prizes in '74, and this is my first prize from that year. Speaking of that, I have 22 prizes now, of the 66 issued to date that I know about. I'm one-third of the way to a full set! And the insides on the right. 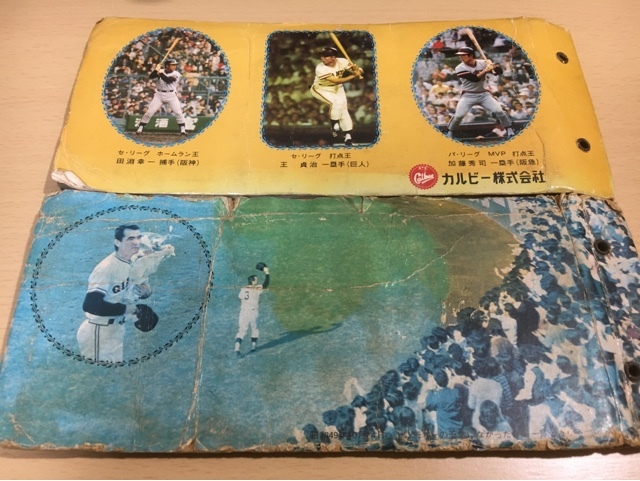 The 1975 binder (top images again) has the Central (left) and Pacific (right) Best Nine. The Central had only nine players, one per position. But the Pacific League has 11 - they usually have a DH (starting in 1975) and there must have been a tie in 1974 ... (checking) ... nothing shows. And I'm too lazy to figure this out right now. I'm sure NPB Card Guy will chime in if he knows anything! And there's another photo of Nagashima here. He had just retired at the end of 1974, but managed the Giants from 1975-1980. He brought the Giants to their worst record ever in 1975, though, and only last place finish, with a .388 winning percentage. He did give them two Japan Series appearances in those six years, though they didn't win either time. It's not terribly hard to find album prizes from the early 1970s, and if you're willing to get a less-than-perfect example they aren't too expensive - a few bucks, usually. The 1980s are another story. Let's start with the pack. The black borders at the top and bottom clue English speakers into what's inside. Other important information on the front tells you they're shiny player cards with a signature design. There are 36 cards in all, with six rare cards. 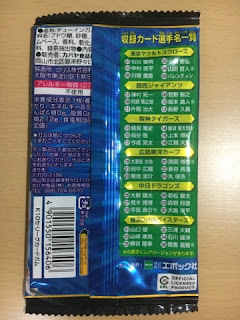 The back gives nutritional information on the left side, with a full checklist on the right. Each team has one SP'd card, designated by a star. Did I get an SP? No. Atsushi Nohmi isn't exactly a high-dollar card in the set, but whatever, I opened one pack. 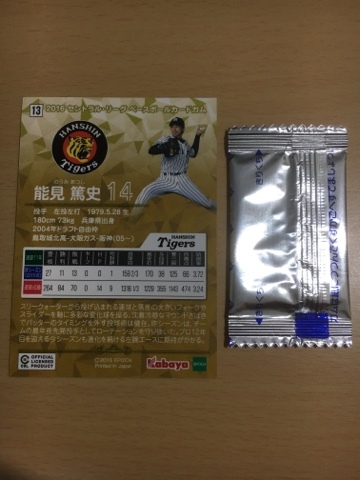 You can see the gum package, too, completely isolated from the card. I wouldn't mind having an SP. But they carry a surprisingly high premium. The real surprising thing here is the lack of a Pacific League version. 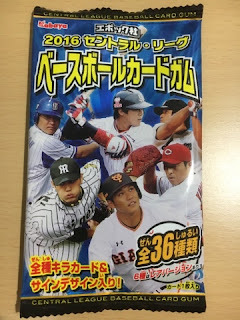 The Central League does have a bigger collector base, but they're missing out on the Fighters and Ohtani, just to get started. While these cards were packaged to be sold at convenience stores, the only place I've ever seen packs - and still do today - are at card shops. 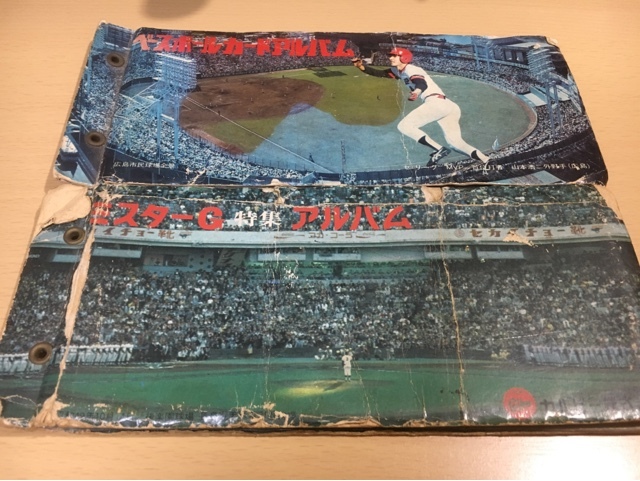 One unique aspect of NPB balls is that until a few years ago, each team supplied their own. There were requirements in terms of quality, weight, and so on, but I'm sure each team had their own little tweaks on the balls to match their team's strengths. And beyond that, each team has their own logos on the balls. One of these balls isn't a gamer. Which one do you think? 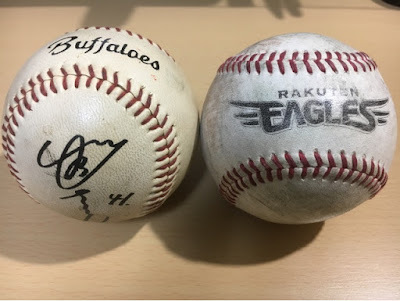 The Buffaloes ball is a facsimile. It has a little wear and tear, but it ain't real. Well, it's real in the sense that you can touch it, hold it, and throw it. But it never touched an NPB field. It does have some wear and tear, though, either from use or poor storage. The biggest giveaway here is the excessive shinyness giving it away as not having a real leather cover. The Eagles ball might be a gamer, or could just have been a practice ball. But it has a more matte finish from use, and just feels right in the hands. Sorry, you can't hold a ball through your computer screen. And even if you could, I wouldn't let you. I know you just ate chocolate and have messy hands. I have an official NPB ball already, though it isn't game-used. I picked it up when I went to a game back in 2012 or 2013. I'd like to get a couple more gamers if I can. I have a lot of game-used balls, though I've never gotten one at an MLB, NPB, KBO, or CPBL game. I bought an authenticated MLB game-used ball at a Cardinals game, I think. And I've gotten plenty of BP balls that essentially started their life in a game. My KBO balls came from batting practice. And I don't have a CPBL ball yet. I have a handful of minor league balls that I got in-game and a couple BP balls there too. From the 1993 BBM set. I've got most of the '93 set done, and now all I'm missing are all of the Hideo Nomo cards, any holograms I may decide to go after (technically, the set has either 2 or 12, or none), and the key card: Ichiro's rookie card. Here's the back. 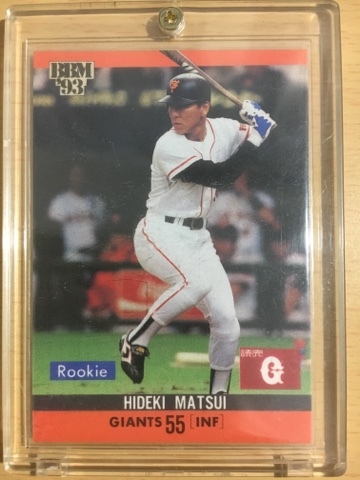 It's amazing that at 19 years old (or even 18, probably, when the photo was taken, fresh out of high school), Matsui looked pretty old - he looks like a 40 year old to me. And no smile. This weekend, I'll be searching for some of those Nomos. He has something like seven cards in the set, though they shouldn't cost too much. Shouldn't. We'll see. Around the turn of the millenium (is that a phrase? ), Japan's idol card industry was really just getting underway. 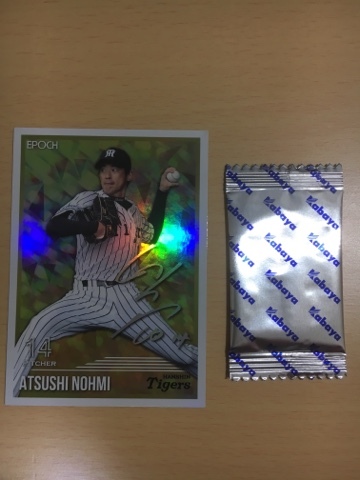 Sure, (not always authorized) bromides could be found of the hottest J-Pop performers, and non-sport sets were being issued, but it's around 1998 that the first pure idol card sets were issued. I should mention that this is based on my own card-hunting experience, and there certainly could be earlier gravure idol sets out there. Instead of single models getting entire sets, many of the releases around this time were collections of girls. And around that time, a lot of race queen sets were produced. The Japanese wikipedia article for gravure idols identifies 2000 as the beginning of the idol trading card industry, and this is when race queen cards began to be sold as well. I recently picked up a random lot of race queen cards at Nakano Broadway, and below is a sampling. Yoko has a knife. Seriously, she's pointing a knife at her eye on the back side. Interesting to note is that the front and back have different models here. I didn't know what I was getting in the lot, but it turns out there were some nicer cards, including this clear card. My scanner hates black backgrounds. This set copies photos on the back. Lazy. This set doesn't copy photos on the back. Winner! Oddly enough, the front of this card from the same set as the previous scan puts a lot of information on the front one would normally find on the back. I wonder if that website still works... nope. This card puts the stats on the back. Those are birthday, hometown, blood type, measurements, and affiliation. The strange background on this card is caused by it being foiled. And it curls just a tiny bit. This is another insert mixed in with the base cards. A couple cards from the 2003 SRQ GT set. I already have at least one SRQ set. Most likely due to the lack of a good established collectors network, finding these old sets isn't easy. I'm sure they pop up a good bit on YJA, but even superstar Yuko Ogura has only singles for sale, with occasional full sets popping up. This is the first true hit in the lot, a costume card. It's serial numbered on the back but there's no idea of how many cards were made in all. And there was an on-card autograph, too! Aya Fujimoto was born in 1983 and appeared in one Japanese movie released in 2005. You can see that the card is embossed. This card isn't from a race queen set, though, just a regular idol set. That's it for today! I should be back on baseball tomorrow. 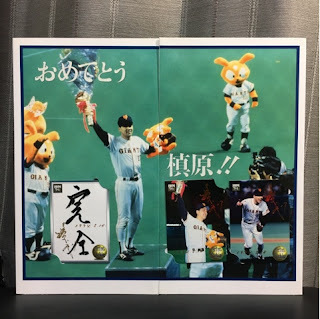 Recently, I brought you a few cards from a magazine called Young Champion. That's not the only magazine that focuses on beautiful young ladies, though. It's hard not to miss what seems to be a third of the magazine rack at the convenience store full of pretty faces. What's actually inside those magazines I might never know, but I do find some of the premiums they offer, usually in the form of trading cards. I had my annual health checkup last week, an adventure that included taking two poop samples, blood samples, and a urine sample, the usual blood pressure, eye check, etc, an EKG, chest X-ray, and even a barium meal X-ray to see my stomach. All of this work was done by Japanese-speaking nurses, and my Japanese skills aren't that good. But I made it through. While the full results won't be in for a few weeks, the first words out of my doctor's mouth at the end was "You must lose weight." But everything else looked good, so far. Anyway, I had nothing else planned until the evening, so I headed out to Nakano Broadway. I'll be going back this weekend to pick up some things I passed on due to cash concerns, but I did make a few decent finds. 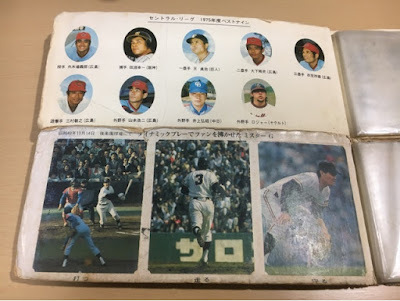 I got two old Calbee card albums and two 1980 Calbee singles (those card images are now added to the 1980 Calbee post). 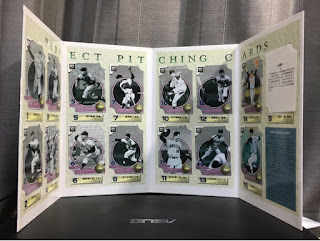 One of the "box" stores had a couple card non-sport card lots I pulled the trigger on, and another had some cards from one of those girly magazines. The first four cards are from Volume 27 and 28 of Girls! magazine, issued in 2009. Erena Ono appears in volume 27. Atsuko Maeda is in volume 27 and volume 28. And finally Yuko Oshima is in volume 28. All four girls used to be members of AKB48. It looks like Girls! included three cards in each issue of its magazine through volume 35. I don't know when they started including cards, but at least issue 15 had cards. The magazine is actually a "mook" and includes a DVD, and is issued sporadically. The latest issue, volume 48, came out in September 2016. Also issued in 2009, this card #G-150 also features Atsuko Maeda. And card G-155 is Yuko Ohshima (Oshima). I haven't done any research to find what magazine this comes from, but it's from the same publisher as Girls!. The numbering scheme just simply doesn't make sense to me right now to say it's from Girls!. This card is a CD promo. J-Pop performers frequently include premiums with CDs, including trading cards. Some performers issue a whole set of cards, found one per CD. Not from a magazine, this is a card from Hits (Hit's). They issued a full set of Yuko Oshima cards in 2010, and have issued plenty of idol and model card sets in addition to this set. It's interesting that the Kinoshita Circus can be seen in the background. I wonder if the circus paid for the placement, simply allowed the photographers to shoot there, or were paid for using their circus. What is the plural form of Venus? That's a Lot of Frosted Flakes!